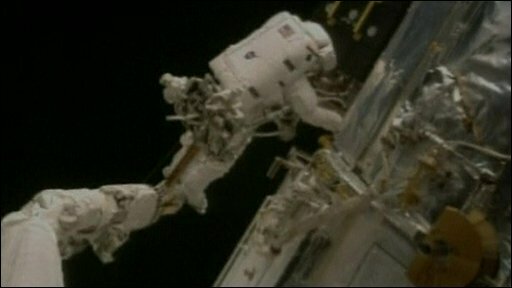 Shuttle Atlantis astronauts have completed the fifth and final spacewalk to repair the Hubble Space Telescope. John Grunsfeld and Drew Feustel renewed the observatory's batteries which enable it to keep operating when its solar panels are in shadow. They also replaced a fine-guidance sensor that helps keep the telescope's gaze precisely fixed on image targets. In addition, the spacewalking pair fitted three thermal blankets protecting Hubble's electronics. Monday's spacewalk lasted seven hours and two minutes. The servicing mission has been a great success so far. Difficult to budge bolts and problematic tools have slowed the spacewalkers on occasions but overall they have been delighted with their progress through the list of planned refurbishments. "This is a really tremendous adventure that we've been on, a very challenging mission. 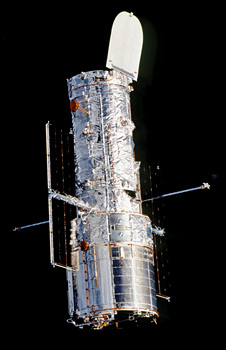 Hubble isn't just a satellite - it's about humanity's quest for knowledge," said Grunsfeld. "A tour de force of tools and human ingenuity. On this mission in particular, the only way of finding the limits of the possible is by going beyond them into the impossible.
. We've achieved that, and we wish Hubble the very best." Hubble will be released from the orbiter's cargo bay on Tuesday, with the repairs and upgrades that the mission has accomplished promising at least five more years of observations. Space shuttle Atlantis is scheduled to return to Earth on Friday.